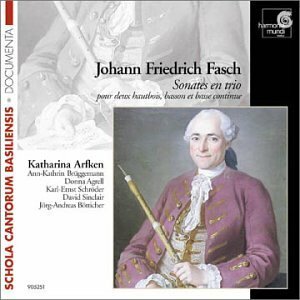 Johann Friedrich Fasch (1688-1758) was a late German Baroque composer, who was overshadowed, even today, by the other contemporary greats of Bach, Handel, and Telemann. Musically self-taught before 12, he then studied with Johann Philipp Krieger at Weissenfels and later with Johann Kuhnau in Leipzig. When he continued to study law in Leipzig, he would found his own Collegium musicum to rival Telemann's in the same town. Nevertheless, Telemann and Fasch would remain on good terms for the rest of their lives. Fasch even regarded Telemann as a mentor in many respects. Fasch would embark on trip in central and southern Germany to study music at a deeper level. The most important person he would come in contact with was probably Christoph Graupner in Darmstadt. In 1722, he would accept a position as the Kappellmeister of the court of Zerbst, where he remained for the rest of his life. Zerbst's court had very competent musicians, but it was not by any means a musical center of Germany. Fasch was known to express a minor frustration about his appointment in several correspondence letters. Perhaps Fasch's biggest miss of his life was his refusal of the Thomaskantor position of Leipzig. After Kuhnau passed away, invitations were sent to prominent musicians like Telemann, Graupner, and J.S. Bach about accepting this post. Telemann and Graupner decided not to take the position, and Fasch later on also refused. This position was given to Bach, where he would hold until his death in 1750. Fasch wrote many vocal works, including cantatas, operas, psalms, etc. Of the many instrumental works, he also wrote dozens of overtures, symphonies, concertos, and chamber sonatas. The remarkable thing is that he never published any of his works during his lifetime. Instead, he would trade copies of his music with other musicians from other courts. It is through this method that his fame and reputation spread throughout the German-speaking countries at that time. Manuscripts of his works are found in many libraries today, like Darmstadt and Dresden. More importantly, Fasch represents a figure of the transition period between the Baroque era and the emerging Classical style, where his music reflects elements in both. The works on this recording are either quartets or trios written for two oboe parts. The oboe was becoming a popular instrument in the German music courts at the time for having a human-like voice and a pleasant quality. Fasch no doubt wrote many chamber works for this instrument, some which required some degree of difficulty. In the quartets, the bassoon even leaves the bass continuo and gets its own melodic line. I suppose Fasch was also fond of the bassoon. I bought this CD during a period when I really started to seriously seek out and collect other lesser-known Baroque composers. It also came at a time where I started to prefer chamber music over orchestral music in the likes of concertos or suites. The trio sonatas of Fasch caught my attention. However, I must confess that I have not listened to them as much as I should have. The musicians on this CD were previously unknown to me, but the group is led by Katharina Arfken, a Baroque oboist who has performed with the Freiburg Baroque Orchestra and other leading period ensembles. Arfken studied at the Schola Cantorum Basiliensis, a Swiss music academy specializing in early music, where she now teaches at too. Interestingly, the remaining musicians are also instructors at the same academy. In fact, Harmonia Mundi made a series of recordings where there musicians were members of the academy. Arfken having played with the likes of Freiburg Baroque Orchestra no doubt understands how to push the music and make things electrifying. Here, she goes a softer and mellower approach, which brings out the "pleasantness" of the oboes that Fasch and his contemporaries were looking for. The tempi are slower but adaquate, the intonation of the oboes is good and rich, and the phrasing is smooth but not dull. In short, this is the Baroque wind chamber music one can enjoy oneself to. Arfken is the large-eye balled woman in the Freiburg Brandenburg recording. I get the sense she is a talented player. Indeed. I had a friend who met her in person at some point. And no doubt, she is one of the top oboists. Yeah, I saw the youtube video of her in the 2nd Brandenburg Concerto.